Bear with me, there’s some history here. 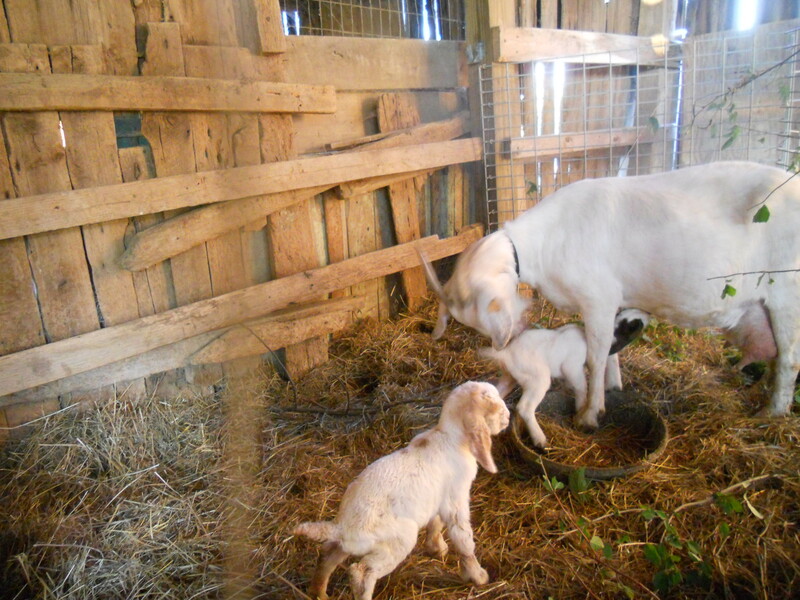 Last Winter my does had four sets of triplets, one of quadruplets and three of twins. A fine crop, but not without losses. Last and weakest of Aggie’s quads, dead within days of birth. The saddest was Edie #27, who lost all three: one, a huge buck, was born dead and the other two were compromised by delayed labor. Thin and subdued, she’s still been a devoted aunt to Aggie’s three. On Genia’s advice, this year I am feeding less grain, which should (has, so far) reduce both multiples and birth size. 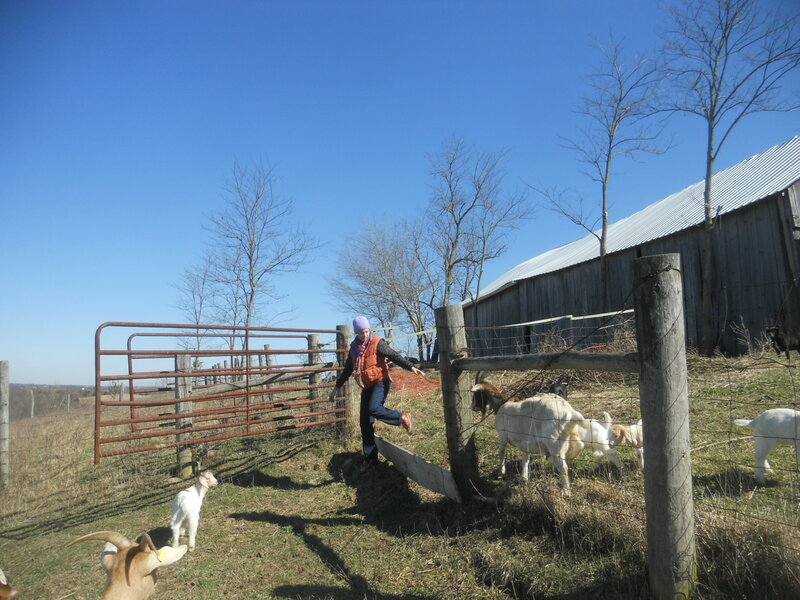 In March, a cheering visit from my newest apprentice goatherd, Alaina. Including some practice in rounding up young Spock, who had successfully challenged his pen and, out among the flock, was showing interest in poor bereaved Edie. Who was, surprisingly, showing interest in him. 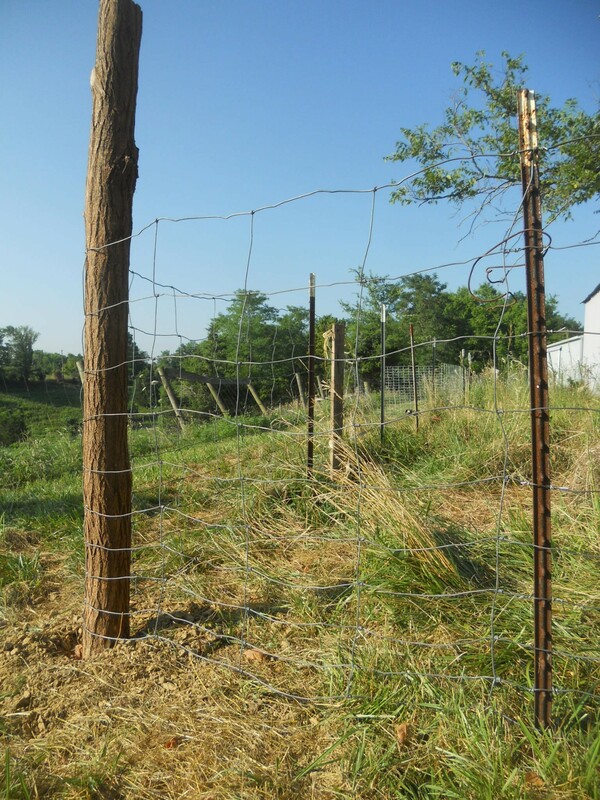 Stout locust corner posts… what works! Then around August 1, she started filling her udder. And the timing (150 +/- days) was just about right. Last evening, Jess put in a wearying hour helping get her into a kidding stall, with an alarmingly distended udder. 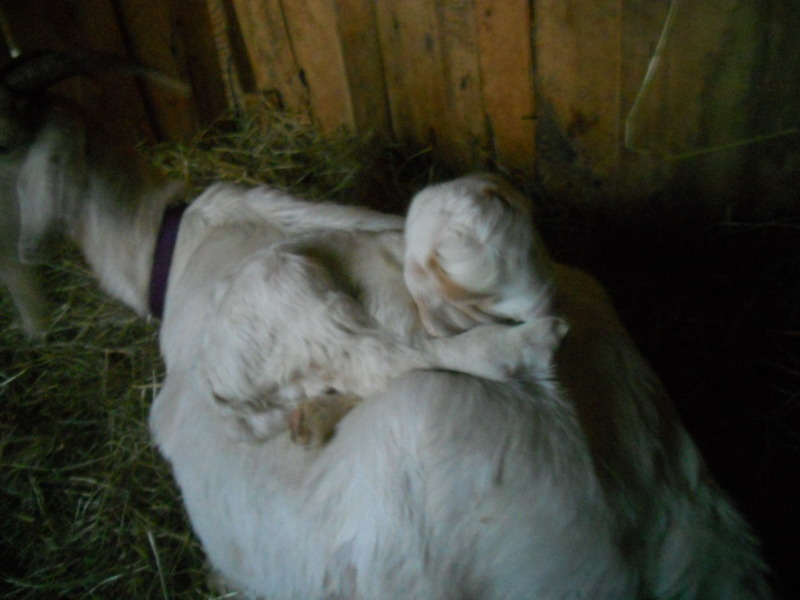 At 6 AM, there were 2012’s newest lives, two lively, but quiet girls, like their sweet mother. After my last post, I hope the point(s) are clear: rewards, sometimes unplanned for, if not totally unexpected: and support, help and friendship. Congrats… That’s really exciting news! Amazing! Your the best farmer, way to tend to the kids. Great work Jess, sounds like you were a huge help! So were you and your partner, dear! Hope you can see the tiny ones soon! Dec 16, the two newest little ones left with Ame for their home at Fpx Run Farm. Edie gets a break from breeding, after 5 kids in one year.